Only ships to United States from Grass Valley, California. orgone Flower of Life Skull That is Cast with 5 Large Tibetan Quartz Crystals, Gold Leaf/Glow Flower of Life and Red Jasper Chips. Features a Tesla coil in the base of the Skull. 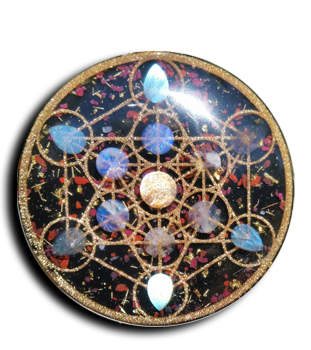 Very powerful orgone, energetically and symbolically.